7 Bev and the Band / "Buenos Aires Girls"
Running Time - 62 minutes approx. And.. Louis Clark, who couldn’t visit Argentina . He was working on "Hooked on China". On September 28th of 1996, ELO Part II came to Argentina for a second time. We want to reflect here and share with you, part of the big party that we enjoyed in the Opera Theater of Buenos Aires. This CD has been made with our respect and admiration for our idols, it was almost hand made and with the final purpose that everybody can feel the same feelings we felt in that moment in this part of South America. We think this is an interesting and valuable work because of the difficulties we experienced in recording the show. We hope you can value all this effort without taking in account any possible technical mistake in the quality of the record. The main thing for us is to contribute a little bit to the big history of the band and, at the same time, encouraging to the fans of the rest of the world to learn more about Argentina. ELO’s Part II members did it. In this issue you can discover an interesting quantity of rare things that enriches this work more. 1. The introduction of Don Airey on Orchestral Keyboards. 2. The Whisky Girls Argentinean version : "Buenos Aires Girls". 3. 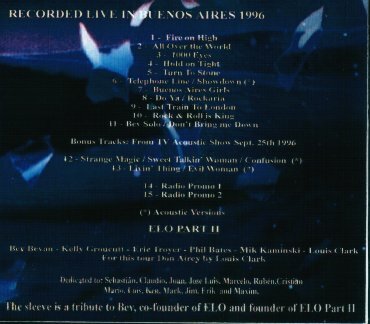 Songs not included in other ELO’s Part II Live CDs like "Fire on High" and "All Over the World". 4. The acoustic versions of : "Telephone Line" and "Showdown". 5. The Bonus Track "ELO Part II in Acoustic TV Show" for TV, from September 25th of 1996. 6. And the great participation of the Argentinean fans. Having now listened to this cd for 3 or 4 times now, I can quite easily say that this is one of the best put together live ELO recordings that I have heard (excluding official professional recordings obviously). The recording was made during the bands' concert in Buenos Aires, Argentina as part of the South American tour in 1996. The release was put together by TRUE ELO fans and this can be seen with the excellent recording quality (apart from one or two fall-offs in sound which is normal during this type of recording), and also the superb artwork for the cd. The cd artwork also states that the recording is a tribute to Bev Bevan - founder member of ELO!! My personal favourite on the cd is the bands reworking of 'Whiskey Girls' called 'Buenos Aires Girls' - the crowd were going wild during this particular track!! In fact the audience were very enthusiastic throughout the concert. My other favourite track on the cd is 'Turn To Stone' which features Don Airey's keyboard playing skills - superb. A couple of bonuses at the end of the cd are some excellent quality acoustic tracks recorded for Argentine TV on September 25th 1996 - tracks including Sweet Talkin' Woman, Strange Magic, Confusion, Livin' Thing and Evil Woman. Also included are a couple of Radio Promo Tracks. Overall then I can thoroughly recommend this VERY EXCLUSIVE LIMITED EDITION cd-r and is a must have for any true ELO and especially ELO Part 2 fan.